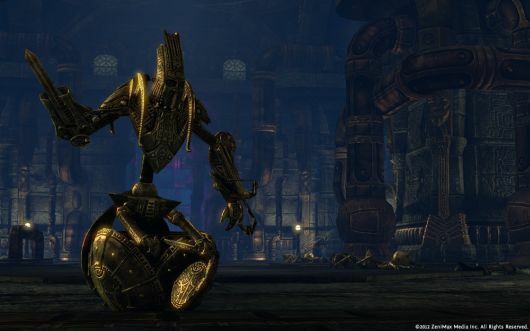 Last October, I paid a visit to the ZeniMax Online studios in Maryland in order to get some hands-on time with the studio’s upcoming MMO, The Elder Scrolls Online. Well, today at PAX East I got to pay the lands of Tamriel a second visit to see how far the team has come since my first look at the game. Honestly, I was initially dreading writing this because I was sure that I wouldn’t have anything to say that I hadn’t said in my previous review, but thankfully, I was worried for nothing. The game was hardly recognizable to me because of the sheer amount of attention that’s been given to it since I first played it in its alpha stage last fall. Gone was the functional-but-barebones UI with which I was familiar; it’s been replaced with a sleek, polished interface leaps and bounds above the (notoriously awful) interfaces seen in the single-player entries of the series. On top of that, I got my grubby paws on a different faction, swapping my Dunmer of the Ebonheart Pact for a Breton of the Daggerfall Covenant. After character creation (which, by the way, is insanely detailed with dozens of appearance sliders and customization options), I was dropped into Stros M’Kai, the starting zone for members of the Daggerfall Covenant. From there I was let loose to roam, explore, quest, and fight for a solid two hours. Let me start by saying that everything I said about the game’s combat system in my previous hands-on still applies. It’s still crisp, responsive, and most of all, fun, which is more than I can say for combat in the single-player TES titles. You won’t find any of Oblivion or Skyrim’s swing, backpedal, swing, backpedal combat here. You have to be on your toes, especially in fights against multiple enemies, unless you want to get your face well-acquainted with the ground. Blocking power-attacks, dodging AoEs, and interrupting enemy abilities are all integral aspects of the game’s combat system, and frankly it just works. My analysis of the game’s progression and character development system, however, is now null and void. The devs have completely overhauled the previous progression system, and I happen to enjoy the new version exponentially more. In the system’s previous iteration, investing points into the core attributes (Health, Magicka, and Stamina) would unlock a variety of bonuses such as increased run speed and the like. That’s been nixed, and while you still get one point per level to invest in your core attributes, they’re no longer tied to any bonus abilities. Here’s how it works: Upon each level up, you’re granted a single attribute point and a single skill-point (skill points can also be earned by completing certain tasks within the game and not just via level-up). The attribute point, as previously mentioned, can be used to boost health, magicka, or stamina. The skill point, however, can be invested into any number of skills that you’ve unlocked. In turn, skills are unlocked through a skill-based progression system. If you want to unlock new two-hander abilities, you simply have to use a two-handed weapon, which will slowly increase your skill level with said weapon (ditto for armor and class-based abilities). For example, during my demo time, I played as a Breton Sorcerer, and thus I began the game with a destruction staff as my weapon. As I played and began to amass more weaponry, though, I decided I wanted to try for a battlemage style of build, so I swapped out my staff for a big honkin’ two-handed sword. Since my Sorcerer had never used two-handers before, he began with a two-handed skill level of 1. After a few quick fights, his skill increased to level 2, unlocking the cleave ability for purchase. Likewise, you increase your skill level in light/medium/heavy armor by wearing armor of that type. The system provides a great deal of flexibility, and by the time my two hours were up, my Sorcerer had gone from a fireball-shooting, robe-wearing finger-wiggler to a heavily armored battlemage who could interweave powerful arcane magic with devastating sword strikes. I do have one gripe, though, and it’s that I feel the game’s progression is a bit too slow. Even the gap from first to second level seemed to be a bit tedious, made moreso by the fact that you begin the game with absolutely no abilities, so you’re stuck with basic attacks until you unlock your first skill point at level 2. I don’t think that progression should be fast, necessarily, but as it stands, it takes four or five levels for the game to really pick up steam. For reference, at the end of my two hours I was somewhere in the neighborhood of level 7 or so. I think not starting characters off with a couple of basic skills is a poor decision, and it’s really hard to appreciate just how fun the combat really is when you’ve got only basic attacks and maybe a skill or two at your disposal. strange, curved Orcish longhouses to massive, towering Redguard fortresses and mysterious ancient ruins, the art style of the game remains true to the source material and brings environments last seen in the old-school Elder Scrolls games (in this case, Daggerfall) to life. The animations, likewise, are fluid and lovely, and overall the game is simply gorgeous. It may not employ the same ultra-realistic style seen in, say, Skyrim, but the balance between stylistic and realistic art is well struck. 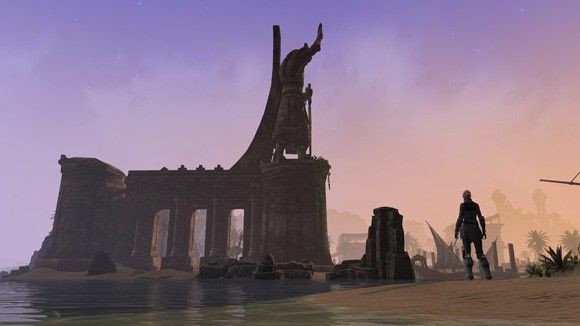 As Massively’s Richie noted in his hands-on with the game last week, TESO features certain quests that, if completed (or not completed), will alter your gameplay in the future. For example, the opening questline for Stros M’Kai involved recruiting crewmen for a pirate captain who recently lost her crew to mutiny. You’re given a list of potential candidates, and you have the choice of recruiting one, two, or all of them as you so desire. Depending on how many of them (and which ones) you choose to recruit, there will be some kind of effect in the future. I went through the trouble of recruiting a particularly cheeky rogueish character whom I was sure I would never see again after I got out of the starter zone, but as I was meandering about the second zone, whom do I come across but said cheeky rogue. He proceeded to provide me with a bit of advice and some assistance in my quest, which was very much welcome. I was later informed that if I hadn’t recruited him during my opening questline, he would never have shown up in the second zone. Initially, I thought ths was a brilliant idea, and I guess it still is, but the more I thought about it the more I realized how meaningless it really is (oh, the existentialism). 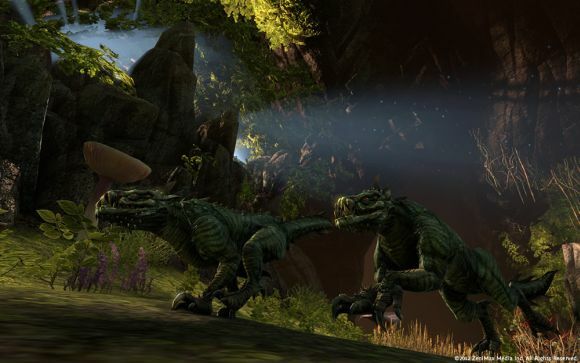 Look at it this way: TESO is, at its core, a themepark MMO. Sure, it’s set up in such a way that makes the questing feel more organic than rigidly structured, but when it comes right down to it, it still follows the formula of finding a (usually static) questgiver, accepting a quest, completing a quest, turning a quest in. So what does it matter that he wouldn’t show up if I didn’t recruit him? Who wouldn’t? That’s how themepark MMOs work, especially if you’re a completionist (as I am). You follow the questline through the zone until all the quests are done and then you move on to the next area, so there’s really no reason not to recruit said characters, and therefore there’s nothing super special or interesting about the fact that they show up later down the line other than that initial reaction of “Oh, neat.” I think this would be a much more interesting feature if it were tied to some kind of special, out-of-the-way event rather than the main questline that everyone ever is going to complete, but maybe I’m just nitpicking.